The biggest Thanksgiving tradition in America is a turkey dinner. Some people also have a secondary tradition of watching football. But libertarians can be a bit quirky, so my secondary tradition has been to periodically share (in 2010, in 2013, and in 2016) a video from Reason about how property rights saved the Pilgrims. But I don’t like being overly repetitive, so I’m thankful that Reason has a new Thanksgiving video. Narrated by John Stossel, it tells the story of the first Thanksgiving, augmented by a modern example of why communal property creates bad incentives. And here’s another video with a Thanksgiving theme. It’s from Prager University and it uses the colonial experience to teach about the failures of mercantilism and collectivism. It’s no exaggeration to say that capitalism was a life-saver for the Pilgrims. And it’s a money-saver for us in the modern era, as Mark Perry points out. The fact that a family in America can celebrate Thanksgiving with a classic turkey feast for less than $50 and at a “time cost” of only 2.21 hours of work at the average hourly wage for one person means that we really have a lot to be thankful for on Thanksgiving: an abundance of cheap, affordable food. The average worker would earn enough money before their lunch break on just one day to be able to afford the cost of a traditional Thanksgiving meal. 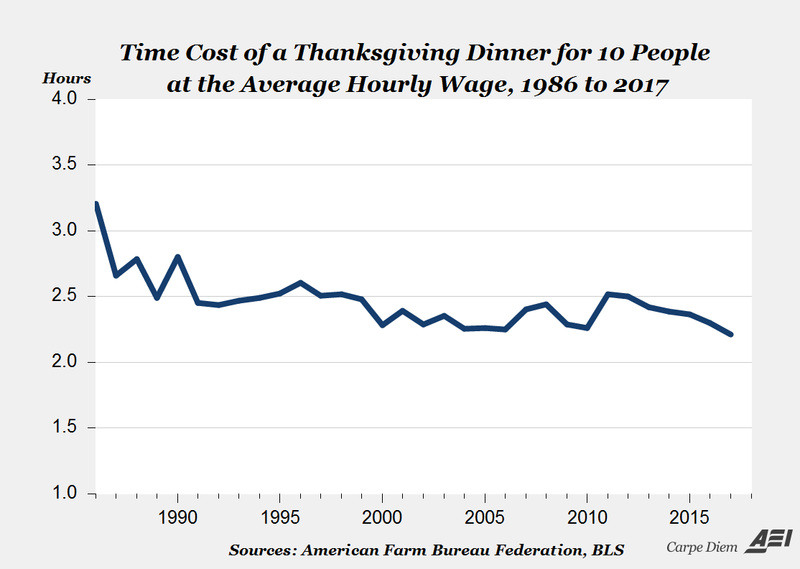 Compared to 1986, the inflation-adjusted cost of a turkey dinner today is more than 23% cheaper, and 31% cheaper measured in the “time cost” for the average worker. Relative to our income and relative to the cost of food in the past, food in America is more affordable today than almost any time in history. Remember, also, that these numbers would look even better for consumers if it wasn’t for the heavy burden of government that gets built into the cost of everything. 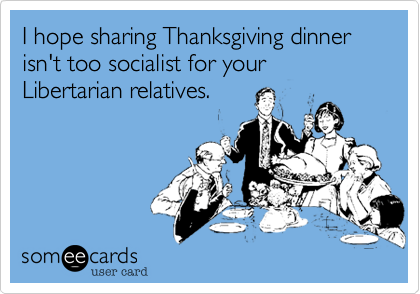 Let’s close with some libertarian-themed Thanksgiving humor. Though anti-libertarian-themed would be a better way of describing this cartoon. Needless to say, libertarians don’t have any objection to voluntary sharing and private redistribution, so the cartoon is wrong. But it’s nonetheless amusing, so I’ll add it to my collection. Just like last year’s cartoon about what happens when there’s a libertarian at a family’s Thanksgiving dinner. P.S. Here are some clever Thanksgiving-themed Obamacare cartoons from 2013. And some Thanksgiving-themed fiscal cartoons from 2012.